Deep historical trends suggest the United States could be moving toward a distinctly novel form of fascism, embracing elements of the historical phenomenon as it appeared in such countries as Italy, Germany, Japan, and Spain while departing in significant ways. A twenty-first century fascism would hardly be revolutionary or totalitarian, as it would involve no dramatic break with the past, following a logic of continuity and building on firmaments of entrenched power going back to World War II. This new type of fascist regime would be driven by a tightening confluence of sectoral interests in American society: corporate, state, military, and cultural – interests favoring oligarchy, authoritarianism, the warfare system, and surveillance order within an expanding globalized matrix of power. The dominant historical forces emphasized by such theorists as C. Wright Mills (The Power Elite) and Sheldon Wolin (Democracy, Inc.), an important foundation of this book, have grown stronger and more pervasive across the decades. An integrated power structure has been fueled by new advances in technology, a money-saturated political system, and neoliberal globalism bolstered by the spread of right wing populism that, among other things, has catapulted Donald Trump into the U.S. presidency. 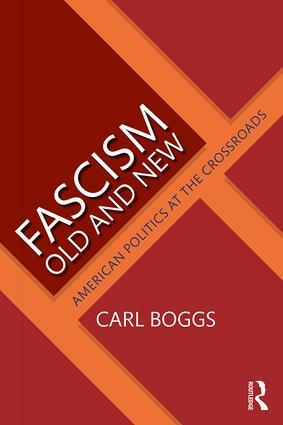 In this book, Carl Boggs explores new political and ideological terrain in systematically considering the prospects for a gradual development of fascism in contemporary American society and, by extension, elsewhere across the advanced industrial world. He persuasively argues that modern fascistic trends, arguably most visible in the U.S., demonstrate a closer affinity with Mussolini’s Italy (corporate state) than with the more extreme Nazi German model of tyranny and genocide. A very timely scholarly enterprise, this book will be of interest to students of contemporary radical politics, fascism more broadly, US political history, ideologies and party politics. 5. Fascism of a New Type? Carl Boggs is Professor of Social Sciences at National University in Los Angeles. After receiving his Ph.D. in political science from U.C., Berkeley, he has taught at Washington University in St. Louis, Carleton University in Ottawa, UCLA, USC, and Antioch University, Los Angeles. In 2007 he was recipient of the Charles McCoy Career Achievement Award from the American Political Science Association. While at National University he has received numerous awards, including Scholar of the Year and three Professoriates for outstanding faculty contributions. He has authored more than twenty books, written more than three hundred articles and has had three radio programs at KPFK in Los Angeles. He is on the editorial board of several journals, including Theory and Society, where he is book-review editor, and New Political Science. He writes regularly for the journal CounterPunch, founded by Alexander Cockburn.